Decompression / Axial traction is a wonderful addition to a chiropractic and rehabilitation protocol when it comes to disc damage. 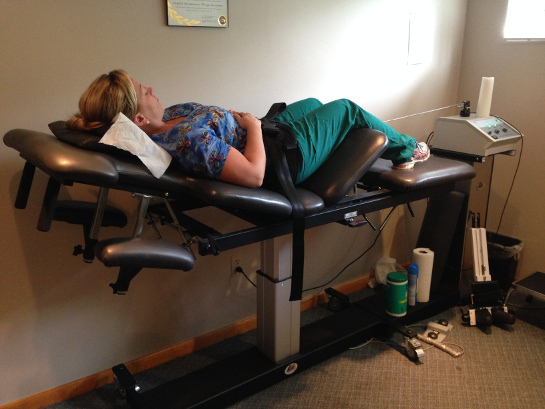 Many people have heard about traction or inversion tables. 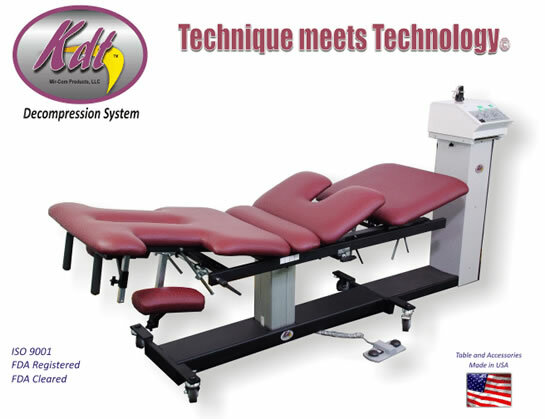 The new computerized tables available (such as the KDT table pictured below) give the doctor much greater control of patterns, time, and intensity in order to gain the most benefit in the shortest amount of time. Dr. Nutter has certification with the Kennedy Decompression Technique so he may deliver the greatest expertise and care to his patients. 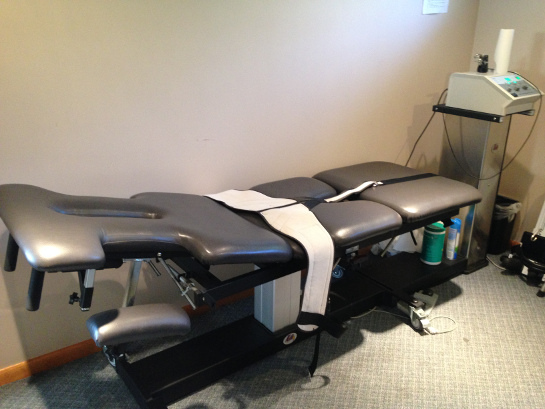 Dr. Nutter has personally worked with a number of patients that have tried chiropractic alone and physical therapy alone but were still looking at an operating table for disc injuries. 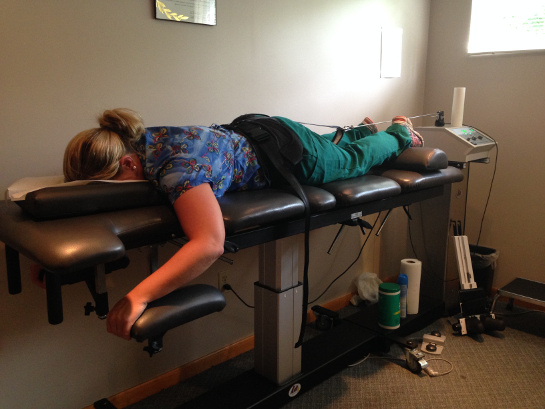 Most of these patients after following a combination protocol of adjusting, core strengthening, and decompression were able to regain a pain free lifestyle without surgery. This is a Quote directly from the Kennedy Decompression Technique Manual. Traction is literal language; Decompression is in a sense metaphorical. What should be understood is that traction (axial elongation resulting in intervertebral distraction) is necessary to allow Decompression (reduced intradiscal pressure) to occur. Keep in mind Decompression is defined along a gradient. 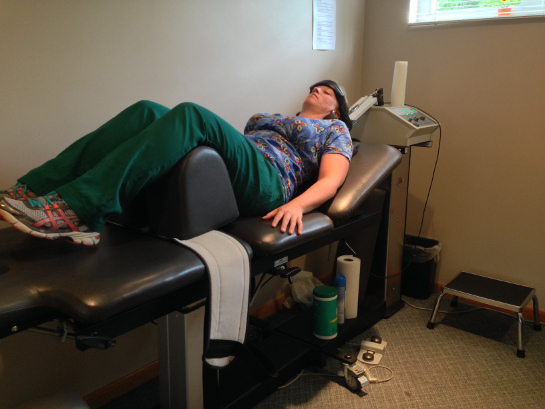 Laying down is decompressive in relation to sitting etc. We can only hypothesize that intradiscal Decompression (negative IDP) is occurring since NO device uses pressure sensing equipment every treatment… thus we say traction is literal, decompression 'hoped for' or metaphorical. We know we are delivering traction we cannot know we are delivering Decompression… defined as negative IDP (though some manufactures will contend they know they do… it is of course hyperbole). The FDA agrees with this… as does Medicare, Blue Cross, and science! Positive outcome (relief of pain) is a substantial indication that Decompression has occurred… & if NOT, at least some healing effect was induced during the therapy… and that is our primary concern.